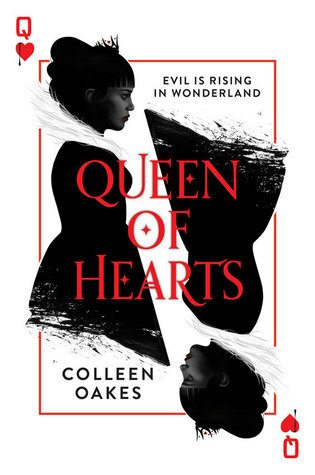 Going into Queen of Hearts, I had high expectations. There is so much potential, so much to work with if you're writing an Alice in Wonderland retelling. I was especially excited because it was from the POV of the Queen of Hearts herself, and I was expecting a badass female character that rivaled Cersei Lannister. I also expected quirky side characters and a really colorful plot. Alas, I didn't get any of these things. In fact, I spent most of the book waiting for something to happen. And nothing did! There were a lot of little things going on throughout the plot, such as Dinah's abusive relationship with her father—The King of Hearts, plus the story's one-sided romance, and a dark secret within the castle itself. And yet, I was not given any concrete details to understand any of these things. They were just . . . there. I had no idea which details were significant and which were not. By the time I reached the really dramatic end, I simply didn't care, and I was happy that I was done with this book. In general, I didn't connect or understand Dinah at all. I wanted her to do something about her circumstances. I wanted her to fight, and really I wanted her to show some kind of depth of feeling—but I got nothing! She just sat around and waited for things to happen to her. I would have been fine with Dinah not being a powerhouse woman, but I just didn't understand her at all. She was so wishy-washy, and I couldn't figure what exactly she wanted in her life other than the crown, though she did nothing to help herself in that case either. Also, Dinah's relationships and/or feelings towards the other characters made no sense. Why does she like this person? Why does she hate this person? Why doesn't she just punch this person in the face? I DON'T KNOW, which generally was the running theme throughout this entire book. Obviously, this book just wasn't for me, but I'm curious about what others will think of it. Have you guys read it? What did you think? Let me know! I was excited about this one for a while, but I keep seeing poor reviews for it, which is a shame. It is a real shame. It was such a good idea. Awe, what a bummer. This is one of my most anticipated reads for this year, so I was hoping to see some really great reviews for it. Ah well. Thanks for sharing your review, and I'm sorry you didn't like it! I haven't seen any good reviews of this book, unfortunately. Thanks for stopping by! That's okay! You can't like them all. I hope you that loved Heartless by Marissa Meyer. Aw, oh no! I was hoping this would be a good one. I've been so curious about it since (a) it's about Wonderland so that's a given, and (b) because Harper saw something in it to rerelease a previously self-published book! I guess it still needs some work! :D Great honest review, Brittany! Yeah, I was hoping it would be good too, but alas. Oh well. There are other great books out there. Thanks for stopping by! I just found this book today and added it to my list of books to buy. Now it looks like I will be taking it off! I read this book when it originally going to be a trilogy and was published by Spark Press & gave it 5 stars both times. They only gave me the first 2 parts before it was picked up by HarperTeen and I've been waiting for the end, but I keep seeing all these bad reviews for it as one book and now I'm concerned they either really messed something up (maybe cutting down to fit into one book? ), or the end is just really bad. I kind of still want to read it, but now I'm scared.